Good morning, Val! I hope I didn't break the linky party rules by linking up the wrong kind of quilt. I have never made a quilt with just squares, and the only quilt I ever made that had a 4x4 grid was my Drunken Dragons quilt that had each block made up of four drunkard's path units. So I linked it, but if you email me and tell me that it doesn't count, I'll delete it! Such pretty fabrics, such summery colours. This will make a sweet little quilt. Dear Val, I just published a post on four-patch mini mini quilts and them saw your post on G+.... What a great timing! :-) I had to come here right away. Have a good day! 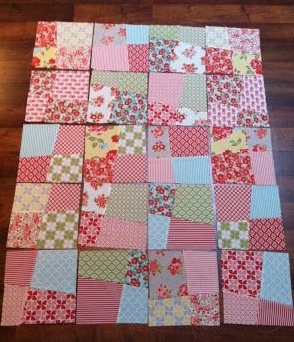 Can't recall making a 4 patch quilt but it is on the list for my scraps..
Those wonky blocks look like so much fun! Great colors too. Thanks for hosting the linky! Very fun! Sometimes you need a break in the middle of another project, that one looks like a very good choice.